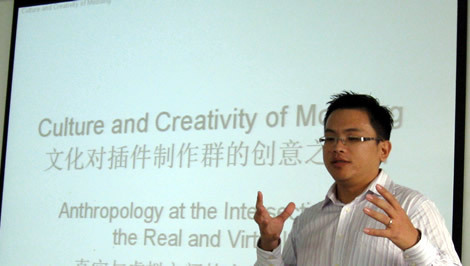 Doctoral student Yong Ming Kow gave a presentation at the Chinese Academy of Sciences in 2008 about his research into the community of modders for the World of Warcraft. In the early years of software development, products were internally driven – companies internal marketing, research and development and user experience team drove the user interfaces and functionalities of the product’s release. These users, or modders as they are called in gaming, can create functionality that is much more suited to their own needs and a lot faster than the manufacturer can, and as second year doctoral student Yong Ming Kow is discovering, modders will have an important impact on the future of software development. Kow and informatics professor Bonnie Nardi are trying to understand, what are these communities like and how can their potential be unleashed. To that end Kow and Nardi have spent the past two years observing and interviewing modders in the United States and China who play World of Warcraft, a massively multiplayer online role-playing game. These user created mods have systematically been incorporated into the game by its developer – Blizzard. Born in Singapore to a Chinese speaking family, Kow was sensitive to the differences of both the American and Chinese cultures and his backgrounds channeled him into his research topic. The work has attracted attention in China and Kow recently gave a speech about the work at China’s Institute of Psychology of the Chinese Academy of Sciences. The ability to conduct research in an environment that is open to the blending of disciplines was one of the major reasons Kow chose the Bren School to pursue his doctoral study. Kow had been working at Central Labs in Minneapolis and Singapore before deciding to pursue a Ph.D. In addition to his research work and studies, for the past three quarters Kow has been a reader, in charge of grading homework, papers, and examinations and holding office hours for various classes. “I enjoyed the opportunity to talk with students, though I can get a bit turned off by students who came to me only to bargain for grades,” Kow said with a smile. Kow lives in Palo Verde, an on campus graduate and family community, with his wife Lee Peng who works at a local auditing company. While he tries his best to maintain a work life balance, it can be difficult when your conducting research in a different timezone. Graduation is still a few years away and Kow is still not sure whether he wants to stay in academia or pursue a career in the corporate world.